It’s been a busy month at Harvest Profit. We’re working on a few key updates to our farm management software. Our primary goal is to help farmers make more profitable farm business decisions. A key aspect of this is building tools to help our users make objective (eg. numbers-based) and less emotional farm managment decisions. Over the last few weeks, we’ve been working on three main initiatives. Our users want a variety of financial and operational reports in .PDF format. They ask, we deliver. We’ve built a custom library that has allowed us to automate the process of turning our software’s tables into well-organized PDF reports. This functionality is currently in place on our enterprise and field-by-field profit and loss reports. Here is the field-by-field report that’s generated by clicking the PDF button shown above. 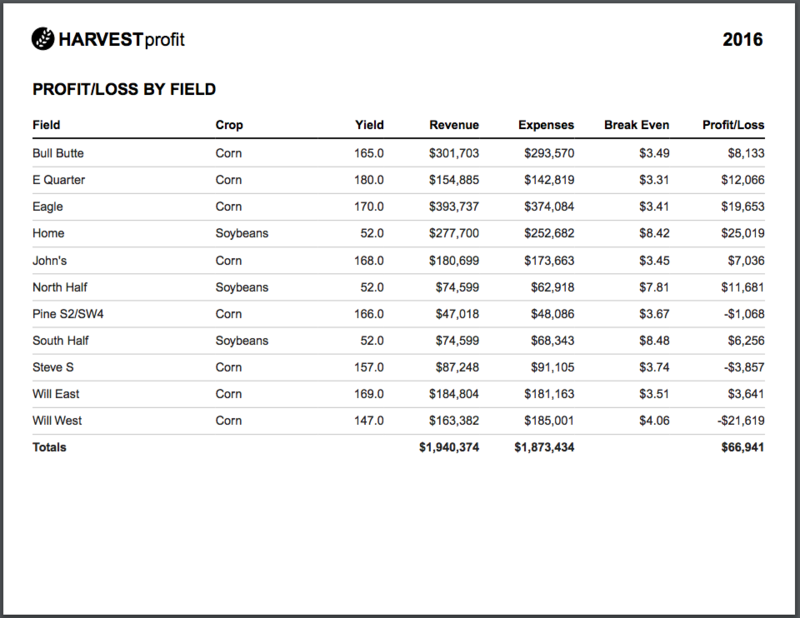 We’re continuing to build a suite of additional reports for our users to use in making first-class farm business decisions as well as to share with their key business partners (landlords, co-owners, bankers, better not forget spouses!, etc.). If you have an ideal set of reports for your farm, we’d love to hear your feedback. Many of our users operate with multiple farm entities. They need to see reports on both an entity-specific basis and a consolidated basis. Many of you won’t care about the specific technology we’re using, you just want to make sure it works. Our current tech stack is great but we’re decidated to using best practices to ensure it stays that way. Once our users have multiple years of financial and operational data in our database, we’re going to have the power to generate some awesome reports (eg. P&L reports by Landlord and/or Year and/or Crop and/or Field and/or Whatever Variable We Want). It’s going to be fun! In order to ensure that our application has more then enough horsepower we’ve decided to switch some of our backend API infrastructure from Rails to Phoenix. According to our research, Phoenix will provide at least a 10x improvement in the latency (speed) of our API “calls”. Well I have to get back to work on making the best farm management software possible! Just wanted to give you an update on what we’ve been working on.